Royal Mail has never done much to promote its opt-out scheme for leaflets. As a result few people know it even exists. Yet, the opt-out scheme will prevent more leaflets than any of the other opt-outs discussed in this guide. We're not talking about huge numbers; Royal Mail distributes roughly three door-drops per week to the average household. The leaflets are mostly from large companies such as Virgin Media, BT, Sky, Talk Talk, Farmfoods, Domino's Pizza, Direct Line and Morrisons. Royal Mail recently made registering with its opt-out scheme a little bit easier. The company always insisted that you first needed to contact them to request an opt-out form, which you then needed to complete and return. Since November 2015 you can download the opt-out form as a PDF document from its website (scroll down towards the bottom of the page). What's more, the form is now also available in Welsh! Please note that you'll have to print the form. If you don't have a printer you can contact Royal Mail on 0345 266 0858 to request a paper copy of the form. Either way, once you've completed the form you can post it to Freepost ROYAL MAIL CUSTOMER SERVICES. Within six weeks the junk mail should stop (according to Royal Mail the junk mail will usually stop sooner rather than later). If you prefer you can also request the opt-out form via e-mail. If you send an e-mail to optout@royalmail.com you'll get the form attached to an auto-reply message. You don't have to write anything in the body of your e-mail; the mailbox is not monitored. If you want your e-mail to be read by a human being you should instead contact them via d2d_enquiries@royalmail.com. Royal Mail will not send you a letter to confirm that your address has been marked as opted out. You'll have to keep a close eye on what your postie is shoving through your letterbox to make sure that your address has been opted out (many people complain that the opt-out service simply doesn't work). Royal Mail will also not ask you if you want to re-register when your registration expires – which happens after a meagre two years. They'll simply assume that you're happy to receive unaddressed junk mail again. This means that you'll have to remind yourself to re-register before the two years are up; if you fail to do so you'll be back on square one. You might want to re-register annually, just to make sure that your registration continues. The Opt Out [sic] service is a totally free service and we even provide you with a freepost address with which to return your completed form. As we have a high number of households that register with Royal Mail to be opted out, if we were then to send out confirmation letters and reminder letters this would then incur a high cost which Royal Mail would need to recoup, which would mean we would then need to actually make a charge for the service, which we do not want to do, as we want to keep the service free. That's right, Royal Mail is effectively saying that posting letters is prohibitively expensive nowadays – even though Royal Mail would be paying itself. Make of that what you will. The Door-to-Door opt-out was invented in 1994, in response to people complaining to Royal Mail about unsolicited leaflets. It wasn't until the summer of 2006 that the existence of the scheme became public knowledge. Roger Annies, a postman from Barry, had told the people on his round about the existence of the opt-out scheme, and Royal Mail was quick to suspend him. It turned out to be a PR disaster for Royal Mail; suddenly every newspaper in the country wrote about Mr Annies' case and, worse for Royal Mail, the existence of the Door-to-Door Opt-Out. Soon after tens of thousands of households asked Royal Mail to opt them out the company started issuing scary warnings about the consequences of stopping unsolicited, unaddressed mail items. The exact wording of the warnings has changed from time to time but the message is always the same: if you opt out you may no longer receive important information, including information about elections. Opting out from Royal Mail Door to Door stops all unaddressed items from being delivered by us (although we do work with Government to get a message to every UK address in exceptional circumstances). Election material is not delivered by the Door to Door service and is therefore not affected by this opt out. Some of the items that we deliver may contain important information issued by local and central Government departments, for example materials relating to elections. Because we cannot legally separate these items from the others we deliver - such as advertising offers or leaflets - you will not receive these if you choose to opt out. The first warning states that signing up will stop all unaddressed mail items distributed by Royal Mail, with the exception of really important information and election material. The second warning claims that Royal Mail can't legally separate such items and that you won't get them if you decide to opt out. Unfortunately, ever since Royal Mail was forced to admit the existence of the Door-to-Door Opt-Out the company has provided the public with such ambiguous warnings. Registering will stop all unaddressed mail items distributed by Royal Mail, with two exceptions: you will still receive election communications and unaddressed mail items which the governments wants to be delivered to every household in a certain area. Election Communications are a vital part the democratic process. Admittedly, the term "election communication" is confusing. By law, every candidate standing in an election is entitled to send one "communication" via Royal Mail to every eligible elector in the relevant electoral area, free of charge. Such items always have the text "election communication" printed on prominently on the front. The reason why these items are delivered to every address is that they're deemed to be an important part of the democratic process. 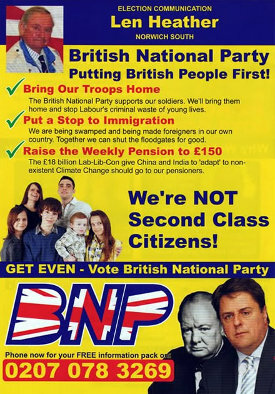 For instance, if you're a racist bigot an election communication from the BNP would inform you that the party is standing in your constituency; that you're not a second class citizen and that Nick Griffin is the new Winston Churchill. Some candidates and political parties also send other political leaflets via Royal Mail. Those items will be prevented if you register – only the one-off propaganda leaflets delivered before an election would get through. The 'Swine Flu' leaflet was delivered to each and every household in the country, including those registered with the Door-to-Door Opt-Out. As for the important items which the Government wants to be posted through every letterbox, such items are extremely rare. 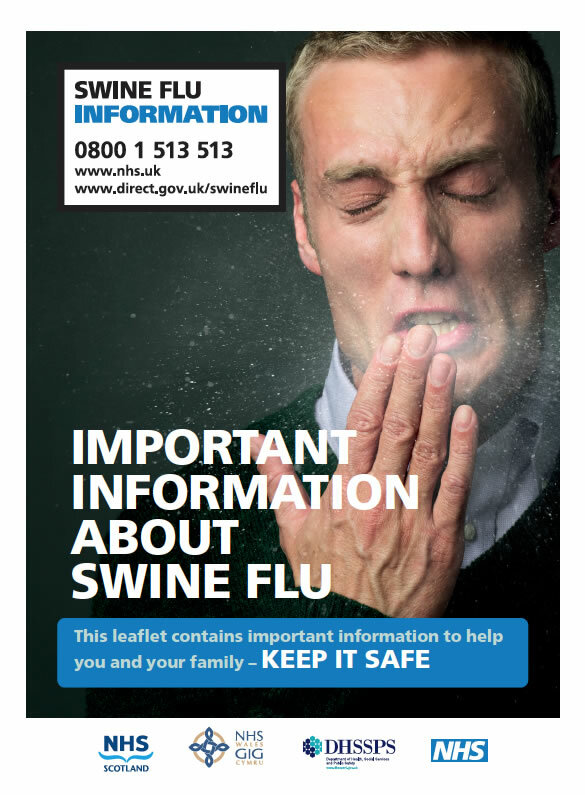 The most recent example is the 'Swine Flu' leaflet that was produced by the Department for Health in 2009. This leaflet was delivered to every household in the country, including households registered with Royal Mail's opt-out scheme. It is, of course, important to realise that signing up to the opt-out scheme will stop all other unaddressed mail items distributed by Royal Mail. This may include newspapers or magazines from your local council. For instance, my local council hires Royal Mail to deliver its Your Norfolk magazine. If you enjoy reading such self-congratulatory propaganda publications, and if your council's magazine happens to be distributed by Royal Mail, you'll have to consider if not getting the magazine through the door weighs up against not receiving all those other leaflets. To enable you to make an informed decision about stopping unsolicited, unaddressed mail items I've been keeping track of all unaddressed mail items delivered by Royal Mail to my address. Since January 2011 I've scanned every piece of unaddressed mail I got from my postie and given it one of three labels: commercial, non-commercial; or charitable. Roughly 5 per cent of the leaflets I'm getting are non-commercial and about 10 per cent are charity appeals. The remainder are leaflets from the likes of Virgin Media, Farmfoods, Domino's Pizza and other such businesses. Posties have to deliver leaflets to people with a 'No Junk Mail' sign. The official reason for the existence of the Door-to-Door Opt-Out is that Royal Mail wants to ensure that people make an 'informed decision' about stopping unaddressed, unsolicited leaflets. As far as I'm aware Royal Mail is the only postal service in the world to have such a noble policy; in other countries you can simply stop unsolicited, unaddressed mail items by placing a 'No Junk Mail' sign on your door. Royal Mail, however, instructs postmen to ignore 'No Junk Mail' signs. This is bad news for people who have no need for unsolicited leaflets. Opt-out schemes for unaddressed junk mail only makes sense if they cover all unaddressed junk mail. Unsurprisingly, this is isn't the case; the Door-to-Door Opt-Out only covers about 25 to 50% of all such literature (depending on how you define 'unaddressed mail'). To resolve this shortcoming the Direct Marketing Association set up a second opt-out service for unaddressed junk mail in 2008; the rather obscure Your Choice scheme. 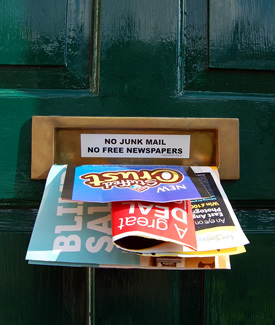 Your Choice will prevent only a handful of leaflets a year; and so you still need to put a 'No Junk Mail' sign on your door to stop unaddressed junk mail not covered by the two opt-out schemes. That's three things you need to do just to stop leaflets you never asked for in the first place… Clearly, it would be a lot easier if Royal Mail would simply respect 'No Junk Mail' signs. Or, to put it more bluntly, opt-out schemes for unaddressed mail exist purely to make stopping such items more difficult to stop. The Door-to-Door Opt-Out stops mail items that don't include a postal address. It will therefore not necessarily stop mail with a generic addressee, such as 'To the Occupier' and 'To the Pizza Lover'. Interestingly, Royal Mail claims that they're still using paper opt-out forms for security reasons . According to its website they want to verify that those resident at the address have requested the opt out. . I guess this means that they're worried that people might start opting out random addresses. Whatever their thinking, Royal Mail's security measures are rubbish. If you download the opt-out form or get the form sent to you via e-mail you can return it with anyone's name and address on it – at no point is anything being verified. It seems that Royal Mail's obsession with long-winded processes and paper forms has got nothing to do with security, and everything with discouraging people to opt out. In November 2011 DEFRA and the Direct Marketing Association announced the Door-to-Door Opt-Out and Your Choice would be merged and that people would finally be able to opt out online. The new service would be called the Door-Drop Preference Service and would be launched in April 2012 – but it didn't happen. The Direct Marketing Association feared that its members would cancel their membership if they suddenly had to worry about respecting people's wishes, and they therefore demand at the very last moment that DEFRA would ensure that non-DMA members would also be part of the scheme. To cut a long story short, the scheme was scrapped some time in 2014. But what about jobs and stamp prices? Some people feel reluctant to stop leaflets delivered by Royal Mail because doing so would mean the company would have even less mail to deliver. There's no denying that junk mail is a lucrative business for Royal Mail, and concerns about stamp prices, jobs and the universal service obligation are perfectly legitimate. However, they're not arguments in favour of force-feeding people unwanted, unsolicited mail. In fact, if you're not interested in unsolicited leaflets you're doing Royal Mail a favour by opting out. The companies that hire Royal Mail's services don't want to waste money and resources on targeting people who aren't interested. One of the reasons why junk mail volumes have declined in recent years is that online advertising is much more efficient. In other words, 'carpet bombing' is no longer a sustainable, long term business strategy. We are pleased to receive your request because we only wish to deliver unaddressed mail to recipients who are interested in receiving such items. This improves our service to advertisers and means that they only produce items for those who are interested, reducing the environmental impact of their mailings and making them more effective. It's your decision. If you feel only mildly annoyed when another 'Dear Householder' letter from Virgin Media arrives and you care greatly about Royal Mail then the Door-to-Door Opt-Out is probably not for you. However, if you feel that all those leaflets are wasteful and you never respond to unsolicited offers you should sign up. Putting up with junk mail in the hope that stamp prices might not go up by another 30% next April is as silly as campaigning for the return of telephone operators. Over the years I've received hundreds of complaints from people who continue to receive unaddressed mail items delivered by Royal Mail after registering with the Door-to-Door Opt-Out. Although the scheme seems to work better than it did a couple of years ago there are still many people who'll find the 'opt out experience' rather crappy. If you've opted out and you find you're still getting leaflets from the postman you could try to ringing the opt-out admins (0345 266 0858). It's not the official route but you'll probably find it's the quickest. They'll be able to confirm whether or not your address has been registered, and if so from what date. If your address has been marked as opted out they'll usually contact your local sorting office to remind them not to deliver unaddressed junk mail to your address. The official route is to contact Royal Mail's customer services department. All they'll do is pass your e-mail to the above-mentioned opt-out admins, which is why you might as well contact them directly. The advantage of taking the official route is that Royal Mail will log your complaint. If they continue to deliver unsolicited leaflets to your address after contacting customer services you could continue to work your way through Royal Mail's complaint handling procedure™. It's important to keep a copy of any correspondence you have with Royal Mail. You may need the copies should Royal Mail continue to ignore your opt-out and/or should you decide to escalate your complaint to the Postal Review Panel. Sometimes Royal Mail advises complainants to register with the Mailing Preference Service and/or to contact the Direct Marketing Association about how to reduce unsolicited mail. If they do, explain that your complaint is about Royal Mail ignoring your registration with its Door-to-Door Opt-Out. The Mailing Preference Service is an opt-out scheme for addressed junk mail and the Direct Marketing Association will not be able to assist you – they've got nothing to do with Door-to-Door Opt-Out. Royal Mail may ask you to forward the items you're complaining about to one of its customer services centres. This is a reasonable request; they want you to establish whether or not the items have been delivered via the door-to-door service indeed. However, it is also reasonable for you to refuse to let go of your 'evidence' and to spend money on postage. You can offer to send photos or scans via e-mail or ask them to provide you with a pre-paid envelope. Or, you could give them a description of the item, including any codes on the item that may identify when and where it was delivered.